Very helpful! This will revolutionize the educational possibilities at SMUG! Thanks! Thanks for adding me to your blogroll and kudos to you for this great screencast. I look forward to working with SMUG. I should have a post ready by the end of this week. 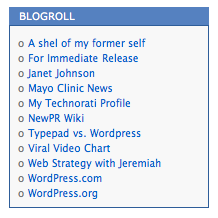 Great way to demonstrate the importance of a blogroll. I liked the Youtube presentation! Next Next post: That’s My Boy!